...) (error "Invalid setting for w3-default-homepage: %S"
Run "make -f ramdiskbin.mk objs exe" to build crunched binary. current-load-list's value is shown below. Used for internal purposes by `load'. 次のものが見つかった。Northeye 有難や。 joey-cvs/public/packages/cvsweb 一応 patch 形式にもして見た (が NetBSD package と、日本語と、ああ面倒 ... っていうほどでもないけれど) ... tracking ネタかなぁ。大袈裟に言えば、三つ枝が要る ? PKG って一行目だけだった。 自分が使うのはどれ ? JP + JOEY ? PKG + JP + JOEY ? MAIN ? 分らなくなってしまった。MAIN だとすると..
error in process filter: url-expand-file-name: url-expand-file-name confused - no default? error in process filter: url-expand-file-name confused - no default? url-expand-file-name is a compiled Lisp function in `url-expand'. Convert URL to a fully specified URL, and canonicalize it. Second arg DEFAULT is a URL to start with if URL is relative. If DEFAULT is nil or missing, the current buffer's URL is used. path components followed by `..' are removed, along with the `..' itself. ;; The URL they gave us is absolute, go for it. ;; Hmmm - this shouldn't ever happen. viewcvs って annotate がない ? これがきょうの主題(theme) :-) と書いて見たが、多分答えは、 「いくつでもいい」 しかし、次のことはどう解釈すればいいのだろう ? xfstt: sync in directory "/usr/X11R6/lib/X11/fonts/TrueType/." No valid truetype fonts found! Please put some *.ttf fonts into "/usr/X11R6/lib/X11/fonts/TrueType"
Ah, good question! The unenlightened often mis-pronounce this word \'net-'a-to.k\. The correct pronunciation is \'ned-*-to.k\ (the 't' is soft, like d, and the first 'a' is a schwa). それで、本当に探していたのは.. 2.2 When I create a folder on a netatalk/afpd volume, I get an Access Denied error, but the folder is created anyway. This is a very common configuration error. The user is not in the group of the parent directory. Then the Mac attempts to set the group of the newly created directory to be the same as the parent, this error is generated. The fix is the change the group of the directory to a group the user is a member of. もしかして cvsweb で出来なくて、 ViewCVS だけにある機能 ? 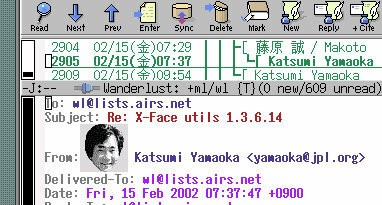 #1 [Emacs] Wanderlust (wl) + w3 ? ついでに load と require の違いは ? =    Enter a numeric constant or expression. <    Enter a left justified string or string expression.
" Enter a centered label. >    Enter a right justified string or string expression. e    Edit the current cell's numeric value. E    Edit the current cell's string part. F    Assign a format to the current cell's numeric value. x    Clear the current cell. c    Copy the last marked cell to the current cell. a new numeric constant or expression. A0 の大きさが 841 m/m x 1189 m/m なのは何に起因するか ?